When a veteran passes away, families often wonder what their loved ones may be entitled to as a member of the armed services. As funeral directors, the paperwork that we must have to establish eligibility for any of these benefits is a copy of the veteran's discharge papers (DD-214) or a Statement of Service. More documentation will likely be required if applying for additional benefits through the VA, but either of these will usually suffice for determining basic eligibility. Burial in a National Cemetery: The local national cemetery is Abraham Lincoln National Cemetery located in Elwood. Who is eligible for burial in a national cemetery? Members of the armed forces who have met the minimum active duty requirements, their spouses and dependents can be buried in any of these cemeteries. They must also be discharged under conditions other than dishonorable. The cemetery will not reserve a space ahead of time, but once a veteran or his/her spouse has passed, an additional space will also be reserved. All headstones are provided at no charge and are uniform. Headstones (VA Marker) in a private cemetery: The VA will provide a marker, usually flat granite or bronze, at no cost to the family. **Please Note: The marker is free of charge; however, most cemeteries do charge a fee for the installation of these markers. Military Honors: We will request for a military detail to be present at the committal service from the specific branch of the service. They will play Taps, fold and present the flag to the family. 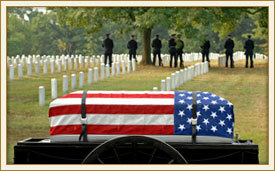 Military honors can be performed not only at the cemetery, but also at the funeral home. Presidential Memorial Certificates: With a copy of a veteran’s discharge papers, we will request a certificate in recognition of your loved one's service. Burial Flags: One American Flag is provided for every veteran, providing the necessary documentation is present. Veteran Medallion: The Veterans Administration is now furnishing upon receipt of claim, the Veteran Medallion, for placement on a privately purchased headstone or crypt. Any deceased Veteran, who passed away on or after November 1, 1990; who was discharged under honorable conditions; and is buried in a private cemetery in a grave marked with a privately purchased headstone or entombed in a crypt, is eligible. If a deceased veteran already has a VA headstone, then they would not be eligible for the medallion. To apply, click here for a claim form. Complete the claim form, enclose a copy of the veteran’s discharge papers and send to: Memorial Programs Service (41B), Department of Veterans Affairs, 5109 Russell Road, Quantico, VA 22134-3903. Reimbursement of Burial Expenses: VA burial allowances are partial reimbursements of an eligible Veteran’s burial and funeral costs. Typically, a veteran must be disabled from a service related injury, pass away in a VA hospital and/or be collecting a service pension to possibly qualify for these allowances. We can determine if there would be any reimbursements at the arrangement conference. To request more information regarding veteran benefits, visit the Veterans Administrations website. To request military discharge papers (DD-214), please visit the National Archives website.